THE line west from Exeter followed the granting of the South Devon Railway Act on 4 July 1844 and covered the construction of a new railway, a continuation of the Bristol and Exeter Railway, west from Exeter to Plymouth. Isambard Kingdom Brunel was appointed as chief engineer, who for the first time since he started construction of the Great Western Railway from Paddington, had to construct a railway over a difficult terrain, the route was very hilly and involved sharp curves, unlike anywhere else on the route, and Brunel had concern that conventional locomotives would have adhesion problems. At around the same time, success had been made of using an 'atmospheric' propulsion system in Ireland, where a pipe was laid centrally down the middle of the broad gauge track which had a leather flap on top. This pipe was connected to a steam powered 'exhauster' which expelled air from the pipe. On the bottom of special propulsion vehicles attached to trains a piston slotted into this pipe and with differences in air pressure either side of the piston trains would be 'sucked' along the line. Brunel decided that this would be used on the section west of Exeter. Construction of the new line commenced immediately following Royal Assent and even though construction was badly affected by poor weather in late 1844 and early 1845 work progressed well. 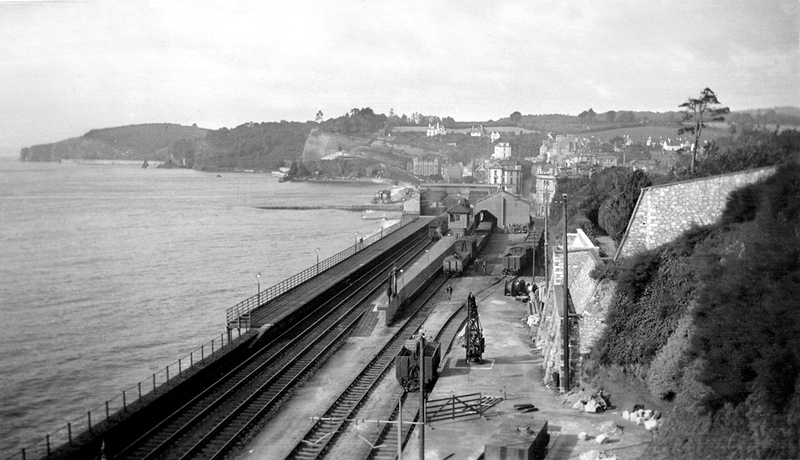 Huge amounts of earth works were required around Cockwood, Dawlish and Teignmouth and some delays were experienced in constructing a wooden viaduct at Cockwood and the series of tunnels between Dawlish and Teignmouth. 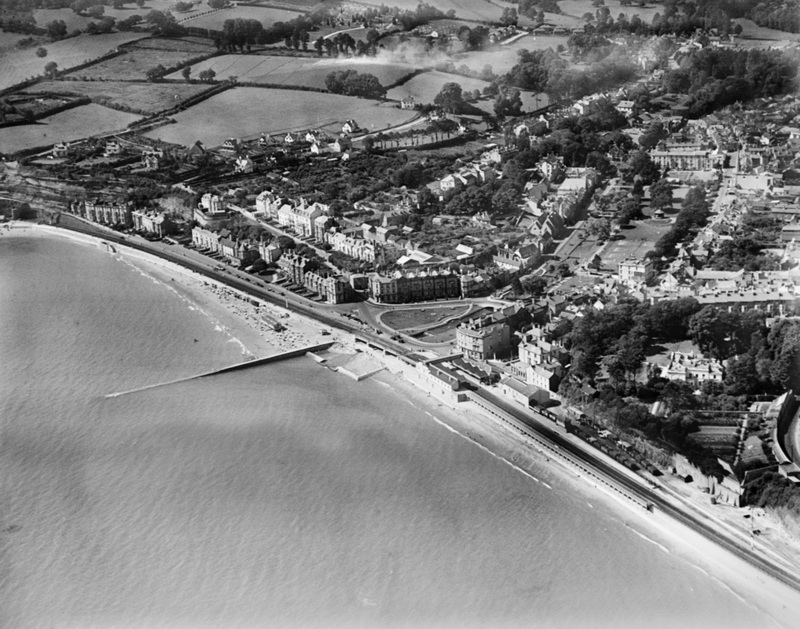 The project was also delayed by constructional and agreement problems with the Harbour commissioners at Teignmouth. The original planned completion of the line in June 1845 did not materialise, and it was not until March 1846 that Brunel decided he could start running trains. However, this would only be between Exeter and Teignmouth as construction was halted at Newton by purchase problems and the atmospheric pipe equipment was late in delivery meaning the line was 'opened' using traditional steam traction on 30 May 1846. The first train formed of 11 four-wheel coaches was powered by hired-in Great Western 2-2-2 Teign (renamed from Viper for the event).The land acquisition problems at Newton (not Newton Abbot until 1877) led to the route west of Teignmouth not opening until the end of December 1846. The first through train from Exeter to Newton was powered by 1841 built 'Sun' class loco Antelope, which took 50 minutes to cover the journey. 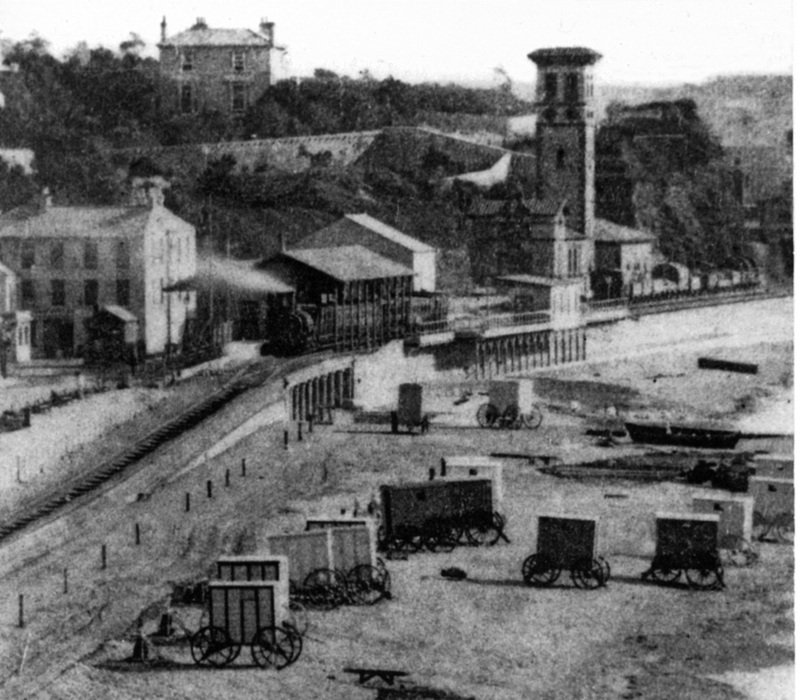 To operate the atmospheric system, Brunel constructed eight pumping houses at Exeter, Countess Weir, Turf, Starcross, Dawlish, Teignmouth, Summer House and Newton. The pipe equipment was delivered in early 1847 and the section between Exeter and Turf saw its first train in mid-January, it was at that time very successful with speeds of 60mph and thousands of people flocking to see the new transport system. After just a few days serious problems were experienced and the atmospheric service was withdrawn with conventional loco operation returning. Atmospheric trains returned to use in September 1847 between Exeter and Teignmouth and to Newton from January 1848. Serious problems still befell the project, atmospheric leakage, water ingress and faults in the leather top seal which included rats eating the leather and sealer. The first frost of the 1847/48 winter saw the railway shut down with the leather seal, by now impregnated with water, freezing. These problems led to the abandonment of the atmospheric project and the replacement of the line with conventional broad gauge track. The broad gauge track remained in operation until the 1890s when it was agreed that its replacement with standard gauge lines was the most desirable option, a major engineering operation was put into force to convert the gauge of the sea wall railway which took effect on 21/22 May 1892. At this time the route from Exeter to Newton Abbot was principally two track, except for a short section between Dawlish and the tunnels leading to Teignmouth. Major earth works and new sea retaining walls were needed to lay double track in this area, to improve working this was acheived between 1902 and 1905.The station at Dawlish Warren saw major development in 1910-12 when loop lines on both the up and down sides were added, this was dictated by the number of trains requiring to stop at this growing holiday location and the need for a method of passing slow trains en route between Exeter and Newton Abbot. The loops remain in place today and are still used for stopping services and a method of passing slower trains by expresses. Between Exeter St Thomas and Starcross one intermediate station existed at Exminster, however this closed in March 1964 as part of route rationialisation. In the heyday of railways, goods yards existed at both Dawlish and Teignmouth but these were again lost in the huge changes brought about by railway rationalisation in the late 1950s and early 1960s. This left just yards at Exeter and Newton Abbot. Exeter yard still remains, but the facilities at Newton Abbot, which once included a massive loco depot and workshop, have now closed. A small yard still remains at Hackney just east of Newton Abbot which is used by Freightliner Heavy Haul and some Network Rail trains. Ownership of the Exeter-Newton Abbot route passed from the South Devon Railway to the Great Western Railway and from 1948 to the British Transport Commission, later British Railways Board. Following the privatisation of the UK rail network in the mid-1990s, the track and stations were transferred to Railtrack, later Network Rail, while two passenger operators presently work services, First Great Western, and CrossCountry Trains. In terms of freight, the lines through Devon were once very busy with non-passenger workings, however today very few freight services operate, these mainly consist of china clay associated products, some cement, engineering trains and log traffic. The MoD Navy base in Plymouth generates a handful of nuclear flask trains each year. 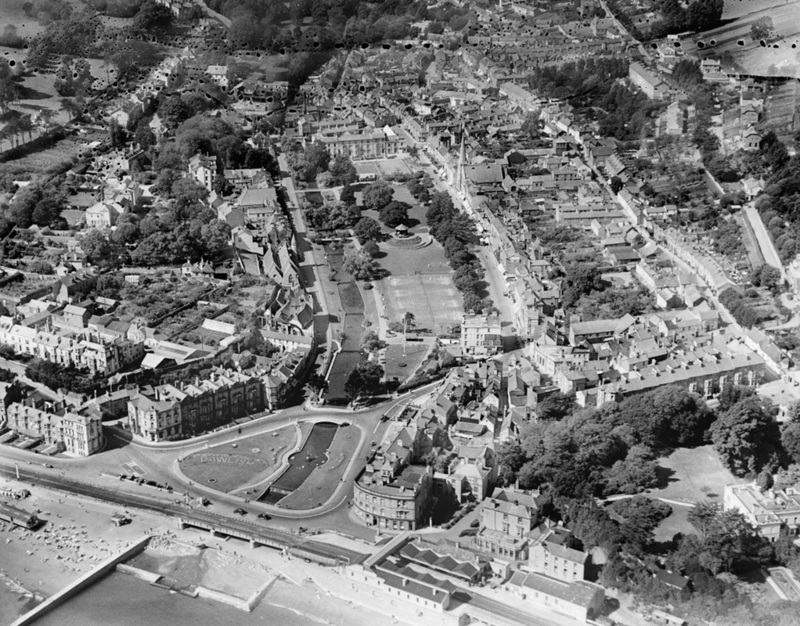 Marine Parade, which at the time was known as King's Walk, Dawlish. 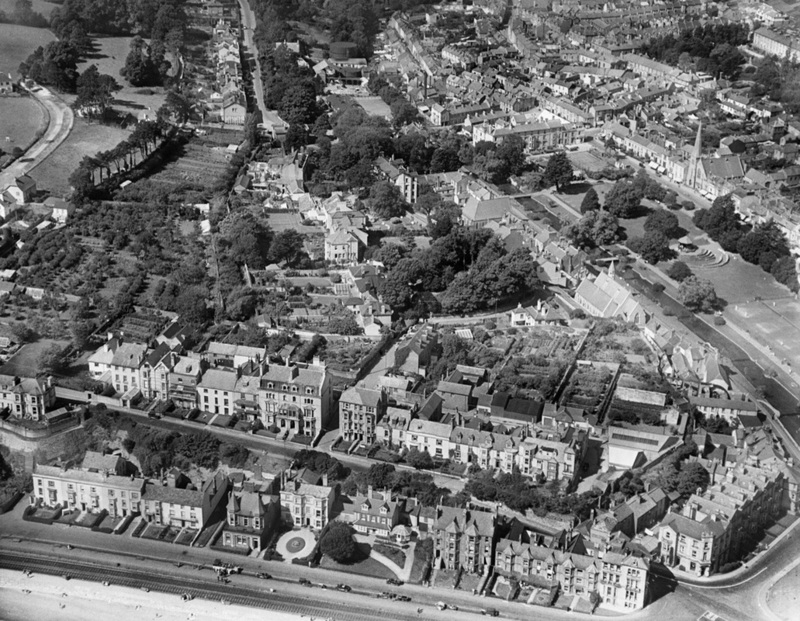 Dawlish station and town centre. The first station at Dawlish. 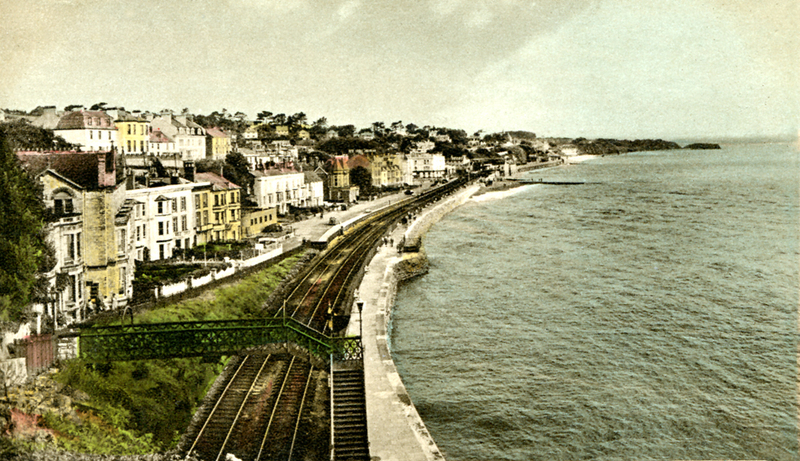 Dawlish showing the Marine Parade area and railway line in the foreground.